This is the perfect dessert for any occasion! Apples are abundent right now and they are SO sweet and tart all at the same time. And, the blueberries add such a wonderful color and flavor. Together this pair is my absolute favorite. But I have to admit and I'm sure you will to, the crumble topping is the piece de resistance, it truly makes this so DELISIOUS. 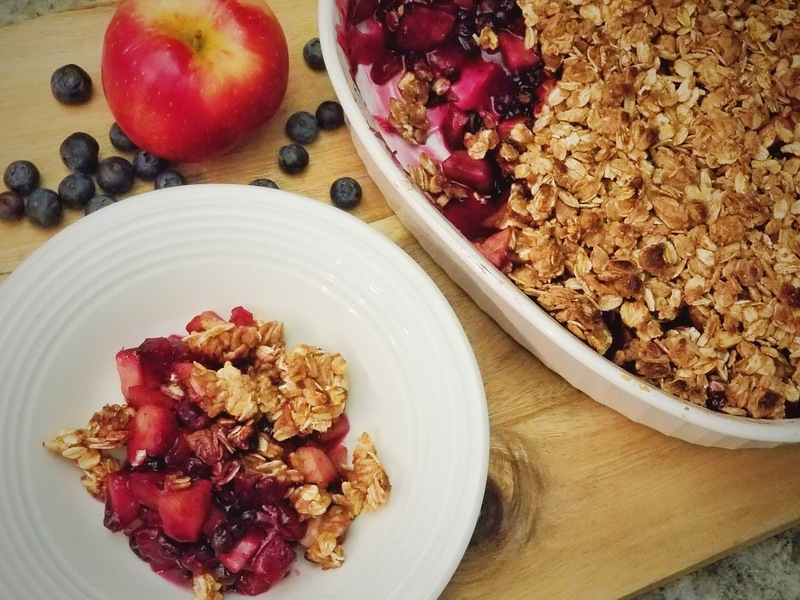 I make different fruit crumbles all year this Strawberry Crumble is really good, peach is another favorite. But this one is a Fall favorite. It's great for any gathering or for an easy healthy dessert anytime. I'll stop talking your ear off and get to it. Preheat your oven to 375 F.
4-6 Peeled and diced Apples depending on size (cut in about 1/2 inch square). I really like Sweet Tango variety, but any apple will work. 1/2 cup Frozen blueberries. I like frozen because they "melt" during baking and create a wonderfully sweet thick sauce.But fresh will work too. 1/4 cup Coconut sugar or organic vegan sugar, you may need a little more depending on the sweetness of the apples and blueberries. I have had to add up to about 1/3 cup of sugar. I usually just mix it all in the oven safe dish I'm baking the crumble in. I hate doing dishes, haha. 1/4 cup Maple syrup. Mix until everything is coated with the maple syrup. 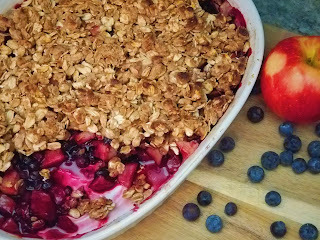 Evenly spread the crumble topping over the fruit mixture. Pop it in the oven for about 25-30 minutes. I always cover it with foil after about 20 mins once the top is browned. The reason I cover after it browns is so the crumble topping doesn't get soggy. Test an apple to see if it's tender, once it's soft enough to your desire, let in cool for about 5- 10 minutes or you'll be sorry, I promise I know from experience! 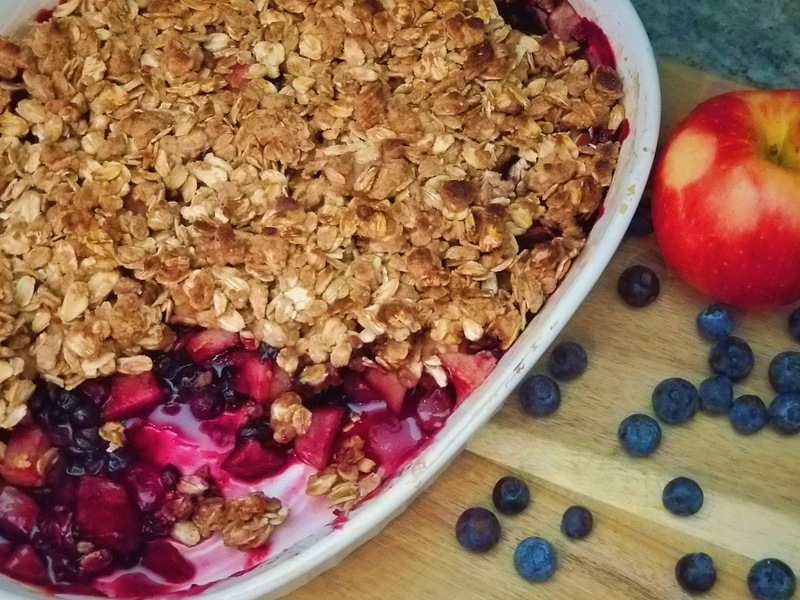 I hope you enjoy this crumble and snap a picture and tag me in social media! Please follow us on social media! I LOVE connecting with you all so much! Here's where you can find us, we are The Plant Eaters on all of them, or you can click the links and you'll find us! Don’t forget to snap a picture and tag us on social media!